Crossrail is required to develop and implement an Environmental Management System (EMS) under the Crossrail Environmental Minimum Requirements (EMR). The Crossrail EMS is certified to ISO14001:2004, the International Standard for Environmental Management Systems. The Crossrail EMS applies to all activities undertaken by Crossrail for programme management of Crossrail including procurement, design, construction, testing and commissioning. Designers are required to have environmental management procedures in place for design and contractors are required to develop and implement their own EMSs and obtain certification to ISO14001. Industry Partners are required to comply with the Crossrail EMR. Crossrail’s EMS includes mechanisms to gain assurance that designers, contractors and Industry Partners are complying with their respective contractual requirements. It was a requirement of the Crossrail Construction Code to produce Environmental Management Plans (EMPs), to discuss these with relevant qualifying local planning authorities and, in preparing them, to take any of their observations into account. To that end, on the central section, Crossrail provided an EMP for information with the first schedule 7 construction arrangements request for approval for each location. To ensure consistency across the project, Crossrail provided an EMP Template for the contract teams to complete as part of their Work Package. An Example EMP is included as a learning legacy document. 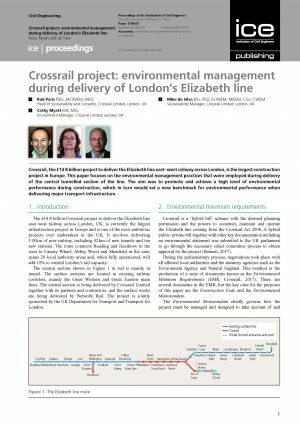 The Environmental Design Management Procedure (EDMP) was developed by Crossrail as a tool to provide progressive assurance that the significant impacts as predicted in the Crossrail Environmental Statement are not exceeded (providing evidence of compliance with paragraph 1.3 of the EMR). It provides a checklist of topics and guidance to be followed to identify changes in the design of the works which may result in new significant impacts. 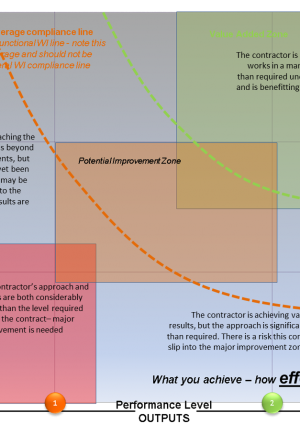 The EDMP was implemented as an iterative process throughout the design development (i.e. from initial reference design to final design issued for construction) and also during construction, to assure any material changes in temporary works design. Requirements relating to environmental design management were written into Crossrail contract Works Information. The output from the EDMP was the Environmental Design Statement (EDS). The EDS was mandated through the design assurance process as one of the deliverables required to be produced by contractors in order to provide evidence of compliance with the Crossrail EMR. As a result, EDSs were required to be accepted by Crossrail in order for the design to be approved and progressed to the next stage. The works information was a critical document for cascading requirements to the contractors who were appointed to carry out Crossrail construction works. The Crossrail Works Information Part 2B, Section 21 sets out the main environmental requirements for contractors. Environmental requirements relating to design were incorporated into the overall design requirements for permanent design (in part 7 of the Works Information) and more detailed requirements were provided in the requirements for temporary design (Works Information Part 2B, Section 22 .10). 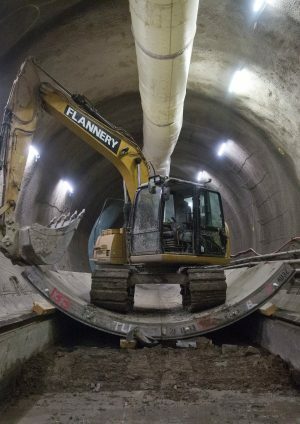 The requirements were developed by Crossrail and were based on the Environmental Minimum Requirements (EMR), plus additional requirements imposed by Crossrail which ensured that the project was designed and constructed using current environmental best practice. Workshops were held to review the effectiveness of Part 21 of the Works Information, involving representatives from Crossrail Ltd, who acted as the client organisation and representatives from Crossrail’s tier one contractors who were involved in implementing the Works Information. Crossrail’s construction contractors were required to produce detailed Environment Plans (EPs) to provide assurance to Crossrail that the appropriate processes and procedures were in place to implement both the general and site-specific environmental requirements of the contract. 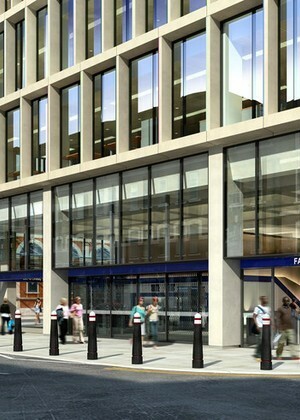 Prepared at contract award, the plans take account of detailed arrangements for construction at each worksite and were for acceptance by Crossrail prior to the construction works commencing. They are required to be updated during the contract to ensure they remain suitable, adequate and effective as the works progress. Environmental data is measured by contractors and provided to Crossrail as part of 4 weekly and quarterly reports. 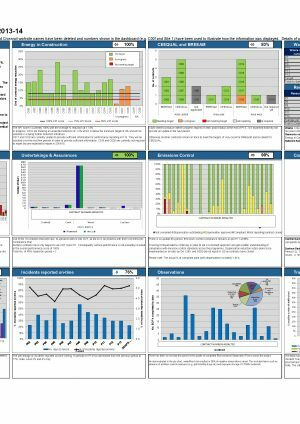 The data is analysed by Crossrail and presented through a variety of dashboards and reports. Environmental incident data was also collected. The environmental performance of Crossrail was reliant on the combined performance of the Tier 1 contractors. The Performance Assurance process was implemented in 2012 with the aim of increasing performance in the supply chain. Click here for more information on the Performance Assurance Framework. A bespoke matrix and method for environmental assurance were developed on the Programme. Supplier performance appraisals were successful in driving environmental performance – since the 1st iteration in 2012, environment performance has increased year on year. A learning legacy paper on Environmental Supplier Performance Assurance – Civils Phase sets out the environmental framework and processes that were used to measure performance over a three year period from 2012 to 2015, describing the evolution of the process as the project progressed. Crossrail identified environmental competencies for Crossrail employees and provided environmental training and awareness to meet identified training needs. Designers, contractors and Industry Partners were responsible for developing and providing training to all their own personnel as specified in their contractual requirements. It was recognised that training undertaken on Crossrail would not be recognised should the individual move to another major project. A research project, working with IEMA, other major projects and our contractors, has been set up with the aim to identify the environmental skills/competency requirements of a major project. This can then be used to develop certified training that can be taken from project to project. This should cover key roles in both the client body and contractors (e.g. recognising the critical role of the supervisor). It will also inform the contract requirements for future projects by setting clear requirements for competency. The Crossrail Act (the Act) grants powers for the works which relate to the construction and operation of the railway but does not provide for replacement buildings above or around the operational stations and structures (known as Over Site Development (OSD)), which are subject to the normal planning process (i.e. they require a planning application to be determined by the appropriate local planning authority in accordance with the Planning Acts). Section 14 of the Act contains provisions that modify the Town and Country Planning (Environmental Impact Assessment) (England and Wales) Regulations 1999 (SI No. 293) as amended such that any later planning application for OSD must be accompanied by an environmental assessment, regardless of the criteria and thresholds in the EIA Regulations. 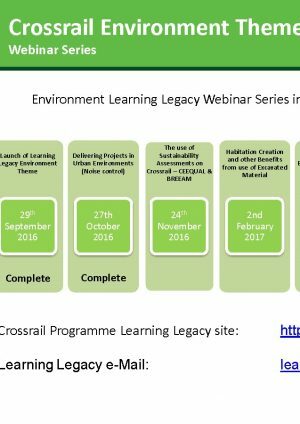 This OSD learning legacy paper explains the Crossrail approach to, and process for, undertaking environmental assessments to accompany planning applications made for Oversite Development (OSD), in particular providing clarification relating to the baseline for the OSD assessment and its relationship to the Crossrail works.